A cast iron bellhousing is used in manual transmission applications to attach the transmission to the engine and to protect the flywheel, clutch disk, pressure plate, throwout bearing, and clutch fork used to mate the engine and transmission. Ford identified bellhousings using basic part number 6394. These bellhousings were typically installed without being painted; blue engine overspray on a natural cast iron finish is appropriate. The bellhousing used behind 428 CJs and SCJs is easily identified by engineering number and the large semi-circular "hump" above the transmission mounting area. This hump was required for clearance with the larger clutch assemblies (an 11.5" clutch disk was used with 428 CJ/SCJ engines) used in high performance applications. Look for engineering number C6OA-6394D. The engineering number location is marked in red in the picture above; the date code is marked in yellow. Engineering numbers and date codes follow the typical conventions for cast iron parts. 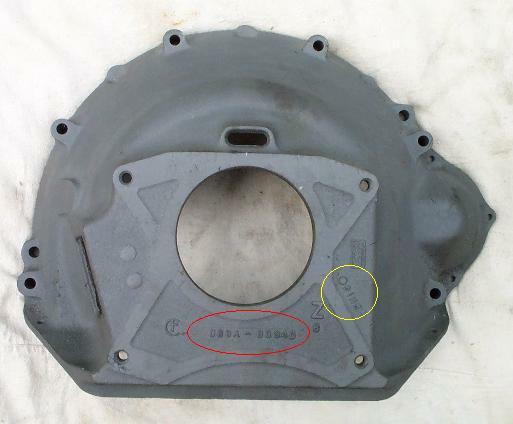 The date code above (8M14) translates to a casting date of December 14, 1968, which means this particular bellhousing was probably originally installed during the 1969 model year. I've also seen printed references to a C6OA-B bellhousing being used in 1968 and 1969, and a C8OA-A bellhousing being used in 1970, but I've never seen such bellhousings "in the wild". If you have, please consider sharing some photos or other documentation.